Tonino Lamborghini Feroce is a fragrance for sophisticated, sensual men. Tonino Lamborghini Feroce 100ml. Eau De Toilette masculine fragrance from the Italian brand Tonino Lamborghini was released in April 2008. Woody spicy fragrance was perfumer Vincent Schaller. Bottle design concept developed by Centdegrés. The essence of the composition reveals the notes of cardamom, cinnamon and nutmeg. Feroce heart is filled with aromas of oak moss and vetiver, and the base includes notes of patchouli, sandalwood and oak. Feroce from Tonino Lamborghini - a fragrance for sophisticated, sensual men, who belongs to the group of woody spicy aromas. 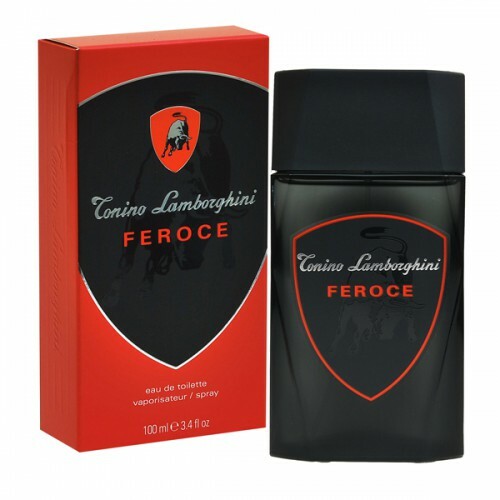 Feroce song was composed by perfumer Vincent Schaller famous brand Tonino Lamborghini and released for sale in 2008. Aroma will give your appearance perfection, reflecting the gloss and glamor, so the necessary image of a real man. You will now be in the spotlight! The composition of this magnificent fragrance includes notes of spicy nutmeg, warm, warming notes of sandalwood, light tobacco notes of patchouli, intense notes of cinnamon, fine notes of oak moss, fresh, invigorating notes of vetiver and the enchanting notes of cardamom.